As part of credit education month, last week we discussed the differences between credit, credit reports, and credit scores. Most of the time, when you hear someone talk about having “good credit” or bad credit,” they are referencing their credit score. A credit score is a numeric summary based on your credit report, ranging from 300 (poor) to 850 (excellent). There are many different models and scales for what makes up your credit score, as it is not an exact science. Below, you can see a quick summary of what factors can affect your credit score. When a lender looks at your credit score, they see the number and four key factors that are affecting your score. This helps them determine the risk associated with lending to you. Next week, we will be discussing how credit isn't based on luck, and things you can do to improve your credit. 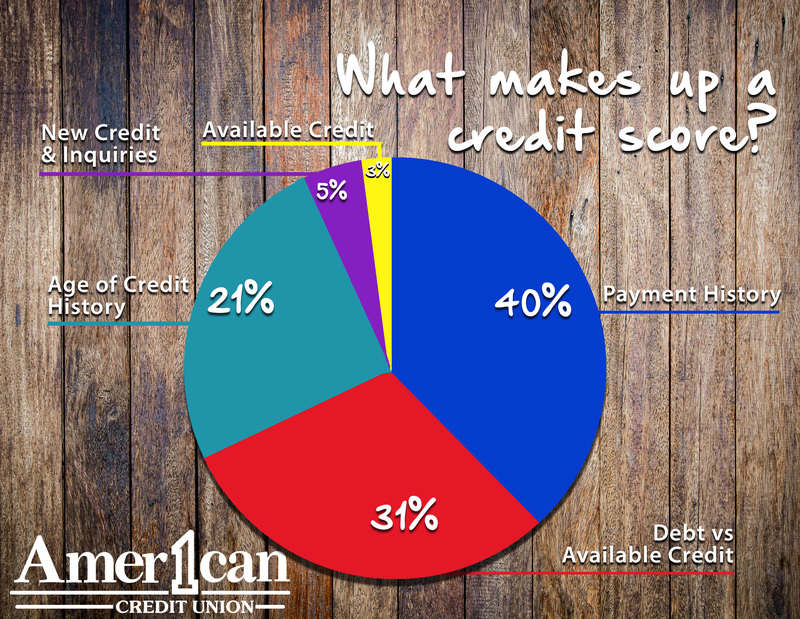 If you’d like more information about your credit score, head to your local American 1 Credit Union and ask to speak with a Member Service Specialist.